Majority of us generally students in this era changed their mind over working for someone by doing a 9-5 job approx 8 hours per day. Still some head towards government jobs and towards big MNCs. That too you can’t get easily nowadays. As a result, those who don’t get a job have only one option for them i,e business and others by choice who want to be a businessperson. If you ask them a question, what do you want to become? Some will say businessman and some will say an entrepreneur. 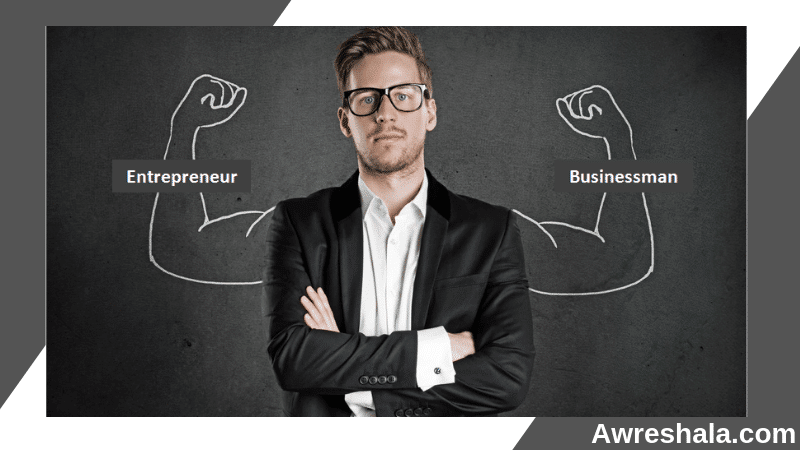 The majority of the general population have a Misconception about the terms businessman and entrepreneur, that both convey a similar meaning. In other words, they have confusion. Because of which they utilize them conversely, I won’t state that they are incorrect as, over the long race, an entrepreneur turns into a businessperson, yet there is a distinction. The person who buys something at some cost and sells it in the market at another cost thus makes some amount of profit is known as a businessman. He sets up his business as another contestant in the market with respect to current businesses running over there. They lack in new ideas. They just follow the trend of the market. The path they have chosen is not so difficult because they have already the customers and market. They don’t have to build new customers or anything else but the fact is that they face a lot of competition in the market and their survivors for a long time is the biggest concern. They make his place in the market with consistency, efforts and dedication and most importantly good behaviour with their customers. Entrepreneurship is the way towards outlining, designing, framing idea, launching and running at first a small business for profit by taking the risk. What’s more, the people who create these types of opportunities are known as an entrepreneur. And they referred their small venture as Startup company. These are the people who are interested in making his own path rather than going towards the trend, which they become a guideline for others. Entrepreneur creates their own market for his own business. But later on, competitors will be there but it doesn’t affect your own position. These are the people with new ideas and innovation and contribute to the economy. In India, the Government has a new scheme called “Startup India” for those who want to do a startup. Govt. will financially support the individual. Generally, the businessman spends their time buying products simply to gain more. But spends a lot of time in framing the idea, implementing it because their work is customer oriented and spends the time to come up with new ideas to create new products for customer satisfaction. Businessman sell is generally trend-oriented and follows the market and don’t try to come up with new products or ideas. But contrary to this, entrepreneur follows their own decision and follow his capability to produce innovative products. They are the risk taker. An entrepreneur indulges themselves in doing business for his/her self-satisfaction, to full fill his own passion and desire to bring something new in society but businessman primary goal is to earn more profit. Usually, businessman steps into the market after seeing the competition so, generally competition is low for them and it’s a basic challenge but an entrepreneur comes with a new idea and a new market so the real deal them for them is that needs a thorough assessment for surviving in an industry. Later on, competition arises like in India Uber and ola running with tough competition. Suppose Anil is a vegetable grocer. He buys 50kg potato at a price $2 per kg and sells it in the market with price $2.5 per kg. This is what more common a businessman do. At last, I want to say Entrepreneur differs a lot from a businessman. His entrepreneurship is created out of his innovative idea and creation and also concerned more about the quality of their products rather than more profit oriented. A “Businessman” is a Businessman. An “Entrepreneur” is a business + man. Hope you all get it, Thanks for reading. Do let me know your suggestions, appreciation in the comment box. Hello buddy, can you let me know clearly what you are trying to convey?. Sorry for not understanding your valuable comment.